(Bloomberg) -- After eating the dust of its German rival for past three years, BMW AG is getting a faster start off the line in early 2019. BMW sales rose 2.9 percent in March and were roughly flat in the first quarter, as surging demand for X3 compact crossovers helped the brand surpass Daimler AG’s Mercedes-Benz. A slump for the small GLA crossover and GLE sport utility vehicle sent Mercedes sales down 9.3 percent for the first three months of the year. 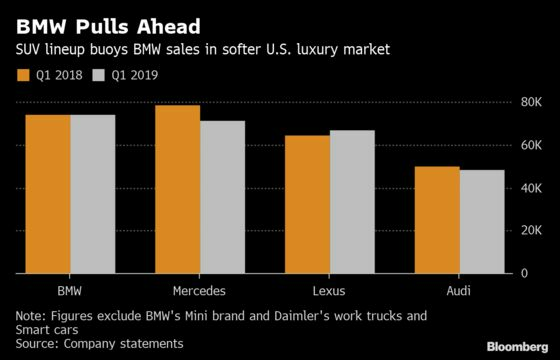 Fresh off a year in which it trailed Mercedes by fewer than 5,000 vehicles, BMW ended the first quarter with a luxury sales lead of 2,717 units. Toyota Motor Corp.’s Lexus had the best performance among the top luxury automakers in March, with a jump in RX SUV deliveries pacing an 8.2 percent increase. The brand boosted sales 4 percent in the quarter. Volkswagen AG’s Audi bounced back from a five-month streak of falling deliveries with a 1.1 percent gain in March, driven by the Q5 and Q7 SUVs. Deliveries are still down 3.9 percent so far this year.